K100-forum.com » General discussion » Brake disk questions. Will these fit a non ABS bike? How hard id it to remove the old disk from the carrier? are they any good? ABS and non ABS are the same however that picture does not show a disc that will fit a 16v RS unless a carrier is also supplied. They will not fit a pre 88 K. I may be wrong and it is a generic picture but do some homework before you buy. I also noticed that it says RS and RT 88, 89 & 90. the disc for 89 and 90 were different for RS and RT/LT. Hmmm. I have a 1990 non ABS 8v. I have messaged them to see what their story is. I will post my findings. That seller hasn't a clue. I wouldn't even waste my time messaging them. @MarcS wrote: Hmmm. I have a 1990 non ABS 8v. I have messaged them to see what their story is. I will post my findings. That will be an LT then we assume. The LT 8v never had floating discs and those in the picture look like 16v floaters to me. Not a chance that they will fit yours. Just bite the bullet and buy a set of EBC, or something, and you will know what you are getting. I second the EBC recommendation. I put some on my K100. Do Spiegler (?) do replacement rotors for K-bike brakes? I know they provide them for BMW airhead bikes, but I've never seen them on a K-bike. Spiegler has a solid reputation. I just had a look at the Spiegler site and can find no reference to K100. Everything else it seems but not K100 . Thanks for the idea though. Thanks mate. I just contacted them too. Europe is about 10 hours behind me (give or take a little) so hopefully I will hear back soon. Those original ones you posted about will fit a K100LT but not the RS of 1990 and $179 is a fairly good price and ATM with discount you can get them for $170. Get in touch with EBC OZ or check on ebay. Here's what they look like mounted. They have spiral vent holes so they look a bit more modern than the BMW OEM rotors. My experience may be an outlier, but I've found the EBC rotors on my airhead BMW have warped. I was under the impression that the floating or semi-floating rotors are not prone to that, but it's happened on my bike. It's all the more puzzling as I'm an old and slow rider, not the sort that would ever overheat the rotors. @RicK G wrote: Those original ones you posted about will fit a K100LT but not the RS of 1990 and $179 is a fairly good price and ATM with discount you can get them for $170. Mine is an RT. 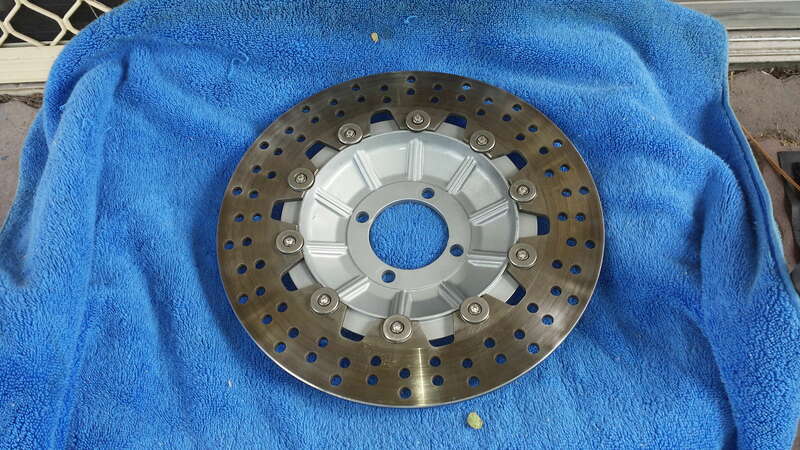 The disks are 285mm but I dont know if they are the same as an RS or LT. So if I am understanding you correctly, there was no RT in 1990? Anyhow , mine has 4 bolts through the wheel and 10 rivets that hold the disk to the carrier. They look identical to yours. Not that it matters really but my compliance plate says K100rt 5/1990. just wonder what engine number you may have that might give a clue to the actual build date ? 2042 I think this is the number of the engine for the year but there may be more meaning in it. Wow. That's awesome. Thank you very much Rick. Can you speak Italian? I got my reply from the Italian company on Ebay. These are the measurements of the disk. I have figured out the first three but Interasse has me beat. The first measurements make sense and will fit my bike. I am just unsure about the last one. I have typed it into Google and come up with lots of translations but none made any sense. WTF is exactly what I meant when I said I couldn't make sense of it lol. I also cant find any measurement on my disks that is close to 178mm. Not even the distance between the disks. I am now waiting for a reply from wemoto to see if it works out cheaper to order from there. I am really counting pennies ATM. Would the "wheelbase" be the measurement of the mounting hole centres diametrically opposed? The wheelbase translation probably is the result of auto-translation to the most common but not necessarily the most accurate usage. Asse means axis and inter translates similarly to the English meaning of between or among. So as Gaz has observed, it could be the center-to-center measurement of opposite mounting holes. Charlie, interesting that at the Wemoto.com.au site those disks were hard to find. Only came up using the DIS1013 number but not in any search of the site could I get to them by brand or bike model number. @Gaz wrote: Charlie, interesting that at the Wemoto.com.au site those disks were hard to find. Only came up using the DIS1013 number but not in any search of the site could I get to them by brand or bike model number. Can you please post me a link to the .au page with these disks on. I searched using the part no. and part name ect. but cant find them. Are they cheaper than the Ebay ones I posted the link to? Here you go - give this a try. I found it by scrolling down to the bottom of their home page then putting in the part number that the guys had found on eBay (DIS1013). Be interesting to see what their discs are like because Kyoto brake pads are complete and utter shite. For all the use they are, you might as well put your feet down. 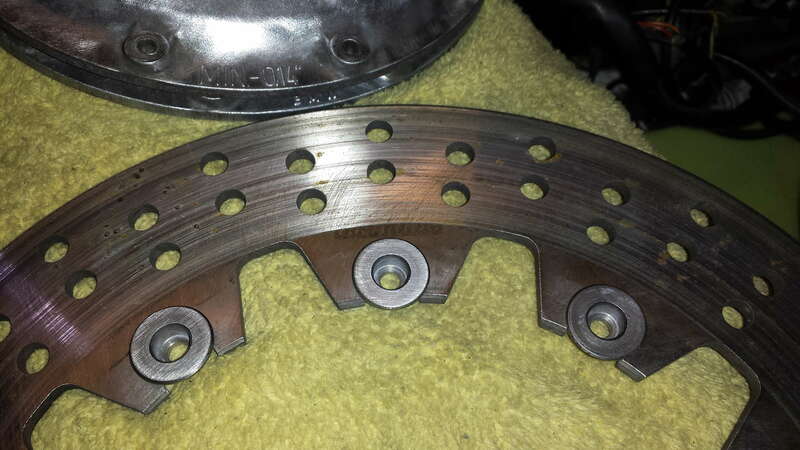 @Dai wrote: Be interesting to see what their discs are like because Kyoto brake pads are complete and utter shite. For all the use they are, you might as well put your feet down. I have tried Kyoto brake pads and I very much agree. Serious wet weather lag with 4 pot Brembos, amazing! I have also tried their clutch plates and they were quite good, so who knows..